spread to the east during the oil crisis of the '70s. 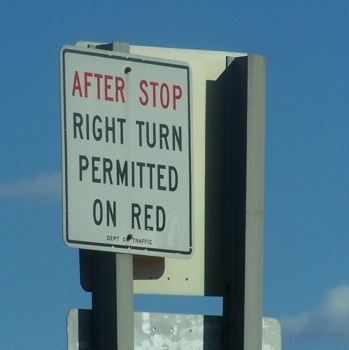 When I got out of the service I lived in St.Louis and they had Right Turn on Red. When I moved back home to Wisconsin, without thinking I made a right turn and got stopped. Told the officer that I just moved and was so used to making a right on red. He had the officer working the desk call Missouri to see if they had that law and luckily for me I had a Missouri license. He told, "Remember! You're in Wisconsin now!" I think Indiana was one of the last states to adopt this rule. It's surprising no one thought of it before it was instituted. It seems so obvious.